If you're allergic to shellfish, you need to avoid all shellfish or risk a potentially severe allergic reaction, such as anaphylaxis. This may seem like a simple task—it means you must steer clear of obvious shellfish like lobster, shrimp, and clams. But there are actually many other types of shellfish, some of which you might not immediately recognize as shellfish. For example, you might not realize that sea urchins and octopus are shellfish. As a person with a shellfish allergy, you have to avoid all of them. To protect yourself, you need to know exactly what types of sea creatures qualify as "shellfish," and where they're typically found in meals, both in restaurants and at home. Read on for a comprehensive guide to shellfish. 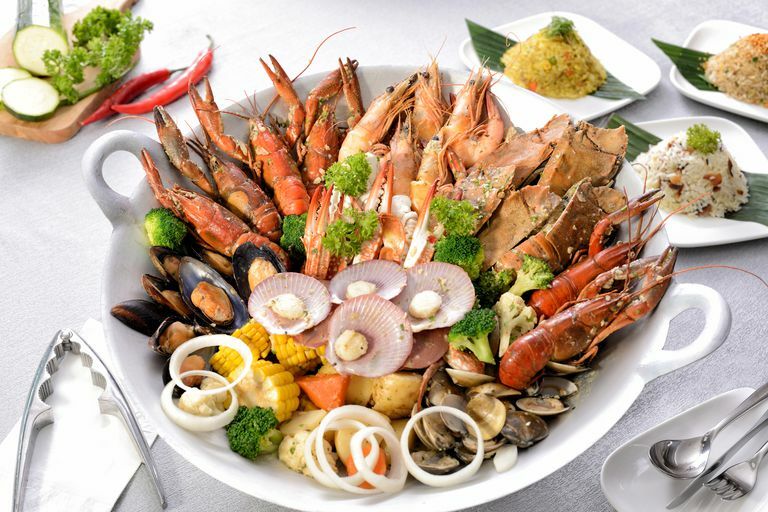 Shellfish are divided into two families: mollusks and crustaceans. It's possible to be allergic to just one of these two types of shellfish (for example, crustaceans), but not the other (for example, mollusks). However, most people who are allergic to one of these actually are allergic to both. Therefore, don't eat any shellfish from either family without talking to your doctor about your allergy first. Unfortunately, you can't trust food packaging to warn you about all shellfish. Food labeling laws in the United States only cover crustaceans, not mollusks. Therefore, only ingredients made from crustaceans must be identified on labels with an allergy warning. This can be problematic for people who have bad allergic reactions to mollusks. However, most food packaging will highlight (or at least spell out) mollusk ingredients, so you should be able to identify mollusk-containing foods readily. For example, a jar of white clam sauce almost certainly will contain clams or clam juice, so you'll know to steer clear. And fried calamari (also known as fried squid) will include calamari. Your best strategy: Make sure to read food labels carefully, and when in doubt, don't eat the food in question. If you have a shellfish allergy, you'll need to be extremely careful when dining out. You may want to avoid seafood restaurants entirely since people with severe shellfish allergies have had allergic reactions simply from breathing in particles of allergens from shellfish that is being steamed, fried, or boiled. Some restaurants may use shellfish stock as a flavoring or base for sauces or soups. Always tell your server or a manager about your allergy, and ask if any items you're considering ordering contain shellfish. Shellfish allergy can cause severe symptoms, and if you've been diagnosed with it, you'll need to carefully avoid all shellfish. Remember that shellfish are not the same type of creatures as fish—people with shellfish allergy may be able to eat fish with no problem, and people with fish allergy may be able to consume shellfish. Fortunately, shellfish can be easier to avoid than some other allergens, since they're an expensive ingredient and therefore are likely to be celebrated, not hidden, in ingredient lists, on labels, and as part of restaurant menus. If you have any questions about which foods you should avoid, ask your doctor for a referral to a dietitian who specializes in food allergy. Food Allergy Research and Education. Shellfish Allergy fact sheet. Canadian Food Inspection Agency. Seafood Allergy.